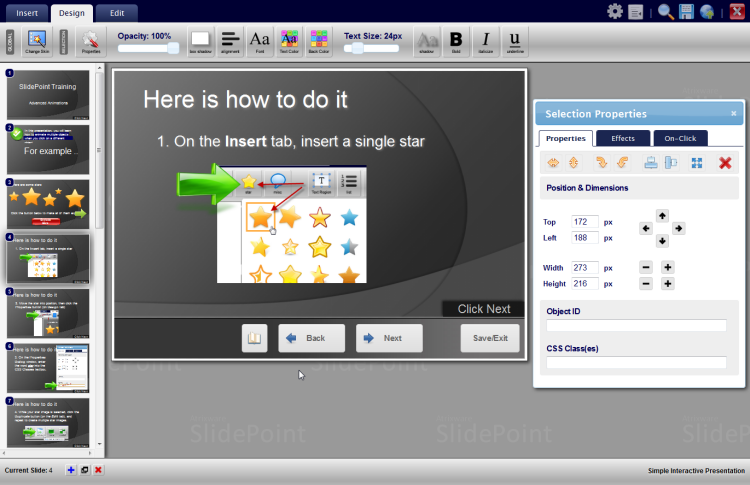 We are just about ready to release our newest plug-in for the Weblearning LMS – called SlidePoint. The best way to describe it is this – it’s like an online version of PowerPoint geared specifically towards e-learning. In short, SlidePoint enables you to visually create and assemble visually stunning, flash-like e-learning presentations, complete with images, text, video, narrations, and even animation effects – all online, and the end result does not require flash! You can, of course, integrate flash videos if you wish (as well as YouTube videos). Another cool benefit is – your presentations will also run on mobile devices. The Weblearning LMS is a powerful, budget-friendly, easy-to-use Online E-Learning System for authoring, managing, and tracking online learning presentations and tests (including your E-Learning Lessons). You can read the brochure, or to try it FREE, go to the Weblearning E-Learning System Sign-up Form. This entry was posted on Saturday, August 13th, 2011 at 2:02 pm	and is filed under ELearning 101, PowerPoint Quiz Maker, SCORM Quiz Maker, Test Pro Developer, Weblearning. You can leave a response, or trackback from your own site.